The Thurston Moore Band (feat. Deb Googe on bass, Steve Shelley on drums and James Sewards on guitar) announced a healthy run of tour dates across the UK and Europe as well as a handful of festival slots including The Great Escape and Clap Your Hands. Full details below with ticket links if available. For those who missed it, The Quietus brought together Thurston and Mark Stewart for a nice interview to discuss "punk, properness and Primark." Another reminder is those in Los Angeles should check out the Printed Matter Book Fair this weekend. Flyer below. SHLOHMO - 'Dark Red' out April 7, Stream New Single "Buried"
Shlohmo’s music thus far exists in the poles between the subtly textured tracks of Bad Vibes and the booming sinister synths and hi-hats of his production work and remixes (such as his split EP with Jeremih, Banks’ “Brain”, remixes for Drake + The Weeknd). Dark Red utilizes Shlohmo’s existing palate but also mines the noises and imperfections inherent in analog production and naturally damaged sounds. Side-stepping current trends that lean towards pristine, computer-generated production, Dark Red explores natural distortion, fuzz and noise as compositional tools, intentionally distressing sounds to echo the feeling of the icy menace and emotional charge found on early black metal tapes. The result is a deeply personal listen, Shlohmo’s boldest statement yet. This isn’t an album which fades into the shadows. The eerie, squalling synths of “Ten Days of Falling” usher in a world of phosphorescent disintegration and decay; from the looming claustrophobia of new single “Buried” to the minimalist pindrop orchestration of “Remains” and the carnal hum of “Ditch”, there is palpable anxiety and discord. “Relentless” and “Slow Descent” explore an internal sense of pain and sorrow that adds a stark emotional charge to the record. “When I started working on Dark Red about two and a half years ago, I had just moved back to LA and built a small studio in my apartment, mostly with my dad’s old gear from the 80s. I had just lost some people close to me and was dealing with another loved one’s health issues. I was all over the place mentally, and I think it reflects in this record whether I like it or not. We will be releasing Dark Red in concert with Shlohmo’s own Weditit Collective imprint (RL Grime, Ryan Hemsworth, Groundislava, Purple, etc.) Shlohmo + Nick Melons run it and they are the best. I Wanna Destroy is a Virtual Reality environment built in collaboration with Portland-based developer Zach Krausnick and the software company Chroma. This virtual world uses 3D game mechanics to articulate experiences not often explored in mainstream gaming; including guilt, nostalgia, family, and transcendence. Audience members explore a changing 3D environment, while their experiences are projected before the entire audience. EMA providse a live score, working to meld semi-acoustic instruments and lyrical content into a digital world. Algiers fuses the rapturous call and response of millenarian gospel, the bellowing urgency of 60s protest soul and the unhinged ferocity of no wave into a visceral music. With an aesthetic informed by sonic revolutionaries from Nina Simone to Suicide, The Minutemen to PJ Harvey, these three émigrés of the American Deep South conjure dead sounds to life in frightening new directions. 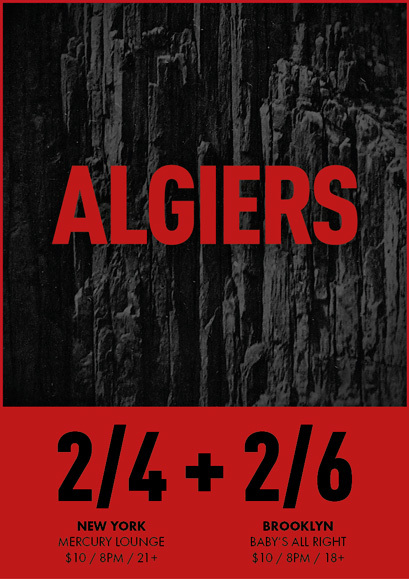 Algiers' self-titled debut album is coming later in 2015 from Matador. Upcoming NYC shows - tickets on sale now.